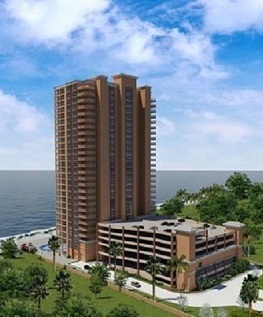 Orange Beach Alabama beach-front condo for sale at Phoenix Orange Beach. Large private balcony with master bedroom access. 18 tile throughout, granite throughout, 10' ceilings, floor to ceiling glass, tall cabinets to fur down, stainless steel appliances, wet bar, and many more upgrades. Owner climate controlled storage closets located in the hallway across from the unit. Great Amenities will include a Nice Lazy River & Water Slide, Indoor Pool & Hot Tubs, Tennis Courts, 9 Story Parking Garage.